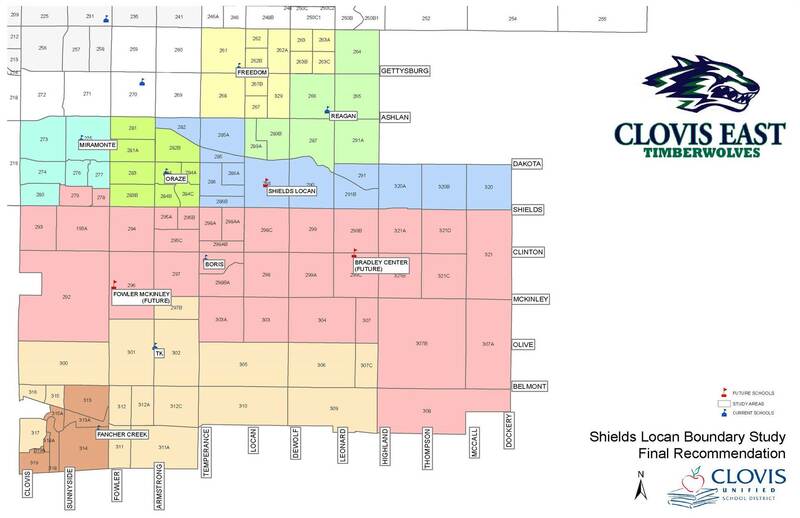 Clovis Unified’s new elementary school, opening in August 2020 in the Clovis East Area, now has both attendance boundaries and a name. 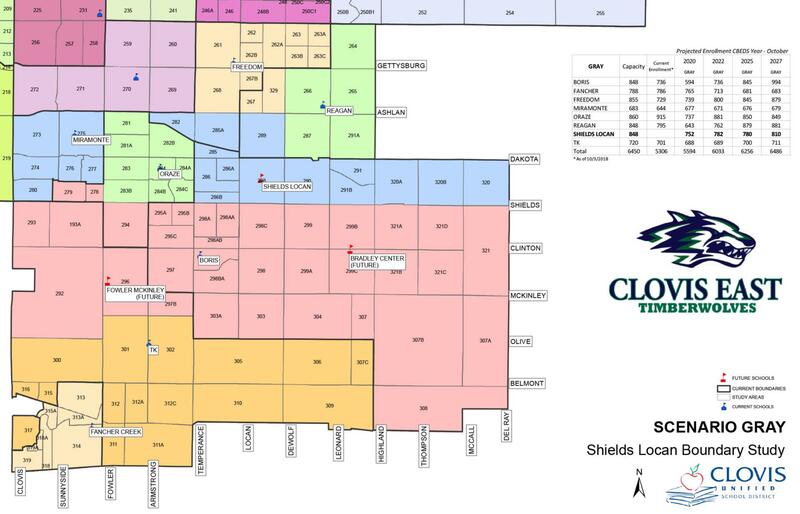 The attendance boundaries were created from within the existing boundary of the Clovis East High School area for the new school near Shields and Locan avenues. The new map was developed after a lengthy study of enrollment projections and city planning documents, and using feedback gathered at multiple meetings held last fall with parents. A copy of the new attendance boundary map is available at cusd.com. The Board, in a unanimous vote, then approved a recommendation to name the new school Dr. Janet L. Young Elementary. In a survey last fall, community members asked that the school be named for an individual who reflects the educational culture of Clovis Unified, its aims and core values, and who embraces diversity, exemplifies the pillars of CHARACTER COUNTS! and has made a positive impact on the community and education. After careful deliberation of multiple names, former Clovis Unified Superintendent Janet Young, Ed.D. was selected as an individual who exemplifies these characteristics. According to several members of the Board in their comments at the meeting, as a long-time elementary school teacher, and an educational leader who advocated for all students and regularly promoted to CUSD employees the importance of caring, Dr. Young was a natural choice to be the school’s namesake. 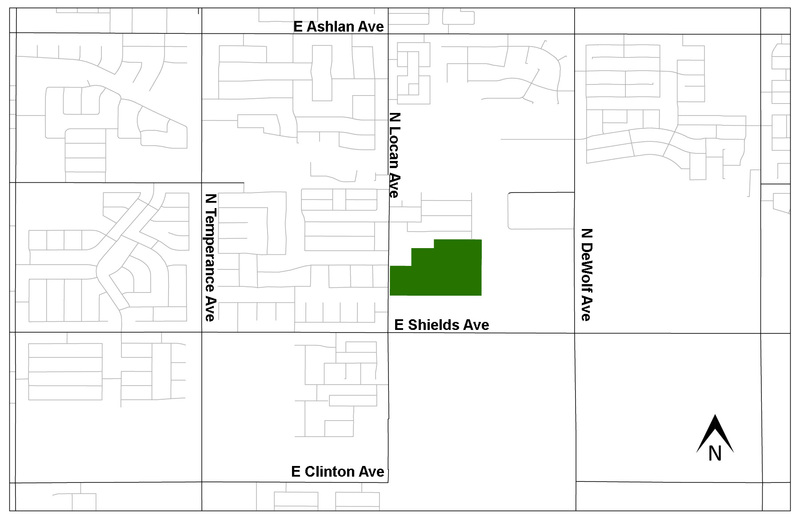 Following a months-long process to study residential development in the Clovis East Area, resulting enrollment trends and neighborhood growth a recommended attendance boundary for Clovis Unified’s new elementary school near Shields and Locan avenues has been released. The recommended attendance area is the result of careful study of feedback gathered from residents in the Clovis East Area collected since November, as well as analysis of city planning data of the area. The final recommendation differs from draft options first studied at a community meeting and available for comment since November after consideration of feedback from the community aligned to criteria used by the District to develop attendance lines. Slated to open in August of 2020, with construction starting in early 2019, the recommended attendance boundaries will be considered by the Governing Board at the regularly scheduled board meeting on February 6, with action taken on the proposal February 20. If approved, the new boundaries would become effective when the new school opens for the 2020-21 school year. Also underway are efforts to develop a recommended name for the new school. A community survey was conducted in December to gather desired qualities in a school name from families in the Clovis East Area, and it is anticipated that a recommendation will also be provided to the Board for consideration on February 6 and action on February 20. Once attendance lines and a school name are place, efforts to develop a school mascot and school colors will begin in collaboration with the new school community led by Principal Kaycey Gibson. Updates about these recommendations will be provided to the community through their neighborhood school and on school and district websites. “By making these decisions more than a full year ahead of the school’s opening, the new school community can come together and build relationships even before the doors open,” said Assistant Superintendent of Facilities Kevin Peterson. A new elementary school will soon be opening near Shields and Locan avenues in southeast Clovis, prompting the start of efforts to adjust elementary school boundaries in the Clovis East area. The school is needed to keep pace with rapidly growing residential development in the area. November marks the start of a process designed to gather parent input, develop options for possible school boundaries, and ultimately make a recommendation on new school attendance lines to the Governing Board in February 2019. Slated to open in August of 2020, with construction starting in January 2019, plans have already begun that will enable attendance boundaries, a school name, mascot and colors to be finalized before the end of the current school year. “By making these decisions more than a full year ahead of the school’s opening, the new school community can come together and build relationships even before the doors open,” said Assistant Superintendent of Facilities Kevin Peterson. Elementary schools in the Clovis East Area are holding meetings this month to share details with parents of the timeline and process that will be used to develop a school boundary proposal and appoint a principal, select a name, colors and mascot for the school. 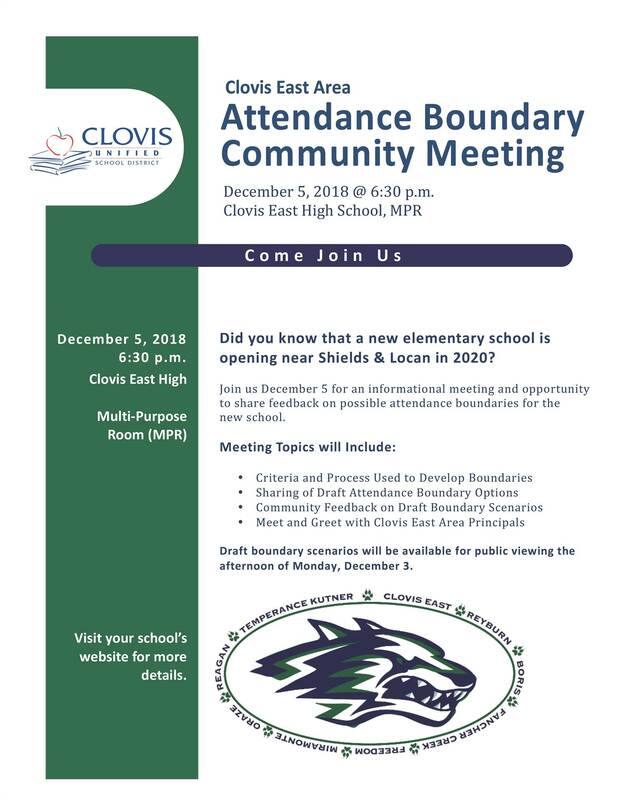 Multiple opportunities are planned for parent and student involvement in the decision-making process, including a December 5 community meeting planned at Clovis East High School, a special web page that includes information and videos about the boundary study process, and regular updates in CUSD Today and school home to school communication. Three draft boundary scenarios have been developed by a study committee, and will be the starting point of discussion at a meeting Wednesday, Dec. 5 at Clovis East High School (details at right). Q. Is there a set of criteria used to guide the development of elementary school boundaries? A. The Boundary Change Steering Committee considers five guiding principles in the development of possible school boundaries. These include: utilize existing school design capacity whenever possible; keep neighborhoods together; create long-lasting boundaries; create contiguous boundaries that minimize gerrymandering; and where possible, reduce operational costs (e.g. busing). Q. Who makes the final decision on school boundaries? A. The Boundary Change Steering Committee studies possible boundary scenarios before publishing a proposed boundary for community review and input. After processing feedback from the community, a final proposal is made to the Governing Board for their consideration. It is then the Governing Board’s role to adopt the official school boundary. Q. When will an initial boundary proposal be available for review? A. Initial draft options were released to the community on December 3. A final proposal will be released in early February, with the Governing Board taking action on a final proposal in February 2019, a full year before the new school opens. Q. What areas will be included in the Shields-Locan Attendance Study? A. Existing elementary school attendance boundaries in the Clovis East High School areas are included in this study. This study does not include any changes to the existing high school boundaries, but looks at the boundaries of Boris, Reagan, Freedom, Miramonte, Temperance-Kutner, Oraze and Fancher Creek elementary schools to determine the best adjustment to accommodate the new school opening in 2020. None of the current draft scenarios affect the Fancher Creek or Miramonte attendance areas. Q. Will high school boundaries be affected? A. The study focuses on elementary attendance areas within the existing secondary attendance area for Clovis East High School. No changes will be made to existing secondary boundaries as a result of this study. Q. Who serves on the Boundary Change Steering Committee? A. The Boundary Change Steering Committee is made of Clovis Unified employees from a variety of schools, and representatives from many district level departments. These include principals, classified staff, plant operations, food service, transportation, special education, business services and others. Q. What year will boundary changes resulting from the Shields and Locan avenues Attendance Study take effect? A. The school site at Shields and Locan avenues will be under construction in early 2019 and will open for the start of the 2020-2021 school year. Boundaries adopted for the new school will also take effect when the school opens. Q. Will any review of district-wide boundaries be included in this study? A. No. 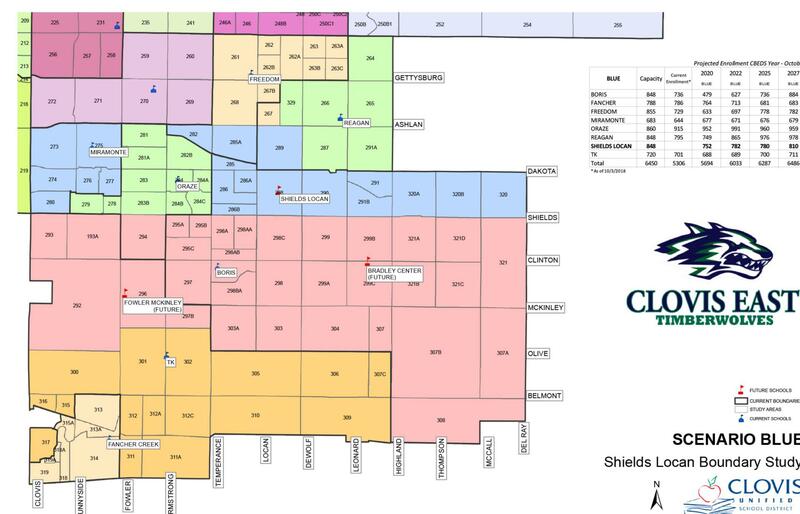 The 198-square mile boundary that defines Clovis Unified School District is not part of the Elementary Attendance Area Study. Q. Will the new school open with a full complement of activities for students? A. Clovis Unified School District is committed to providing students with access to multiple opportunities for involvement in athletics, performing arts and other activities when a new school opens. Every effort will be made to provide resources for students’ involvement in the school’s first year of operation. Q. Why ask families who have established and invested in a particular elementary school to move? A. Clovis Unified School District strongly encourages loyalty and support of our neighborhood schools. The District is fortunate to have active, involved parents who also encourage their children to support the schools they attend. These successful efforts often become the very reason that families oppose necessary boundary adjustments, given their involvement and loyalty to their neighborhood school. While understanding of this challenge, the need to address crowded conditions at schools that greatly exceed their capacity requires that boundaries be adjusted. Clovis Unified makes every effort to proactively plan the opening of new schools in order to avoid situations in which students experience over-crowded conditions that could affect their learning. Q. Why not just build elementary schools larger to accommodate growth? A. Elementary schools in Clovis Unified are designed to support student enrollment in grades K-6 that optimize the learning environment. Using a process that weighs campus safety, creating access to a full array of co-curricular and academic programs, and effective instructional strategies, the District has established current enrollment capacity guidelines for elementary schools. Q. What about students entering the sixth grade in 2020? A. Board Policy 5106 includes accommodation for students wishing to remain at a given school for their sixth grade year. The policy states in part, “Although the Board encourages all students to attend school in their designated attendance area, students entering the sixth grade may choose to remain at the school of their original attendance area if space is available.” Parents will be able to complete an Intradistrict Transfer request for these students. More information about this exception can be found by reviewing in its entirety Board Policy 5106. No home to school transportation will be provided for students on Intradistrict Transfers. Transfer forms are available at cusd.com. Q. What about students who will be in grades Trans-K to fifth grade but have a sibling who is in the sixth grade in 2020? A. Because of the District’s desire to provide continuity of school experience to families, parents of students meeting this criteria may submit an Intradistrict Transfer request and will be approved to remain at their current school. No home to school transportation will be provided for students on Intradistrict Transfers. Q. What about families who do not have a student in the sixth grade in 2020, but who wishes to remain at their current school? A. Families of students in grades Trans-K through fifth who do not have a sibling in the sixth grade in 2020 may apply for an Intradistrict Transfer, but these transfers will be granted on space availability. No home to school transportation will be provided for students on Intradistrict Transfers. Q. What will happen in areas where sidewalks don’t yet exist (e.g. The Camden Place neighborhood on DeWolf/Ashlan if the area moves from Boris to the new school) or the canal is located? A. The District is currently working with city and county officials to develop adequate walk paths in the vicinity of the new school. In cases where an adequate walk path (as described in Board Policy No. 8301) does not exist the District would provide transportation for students or install adequate pathways to the school as has been done in the past within other school areas. Q. If I have a student who will be in kindergarten the year before boundaries take effect can I enroll them directly at the school to which they will be moved to under the new boundary scenario? A. Students entering Kindergarten must first register at the current school of attendance. At the same time, families are able to submit a single year Intradistrict transfer request for their child to attend the new school of attendance. Because some schools are heavily impacted prior to the opening of Shields/Locan these requests will only be approved on a space available basis. Q. Will this new school feed into the District’s future secondary school (The Terry Bradley Educational Center) planned near Clinton Alignment between Highland and Leonard? A. The earliest that the educational center planned for the area near the Clinton Alignment between Highland and Leonard will open is the year 2027, and future decisions about boundaries for this new school have not yet been made. When the time comes to create new secondary boundaries, extensive community engagement efforts will take place to provide multiple opportunities for families to be involved in the decision-making process. Q. Will there be Campus Club provided at the new school? A. Campus Club is planned for the new school. Kindergarten Campus Club is planned for this school, and will be offered unless there is insufficient enrollment to form a program. Q. Will there be preschool at the new school? A. Yes, preschool programs are planned for the new school. Q. What is the timeline for selecting a school name, colors and mascot, and hiring staff for the Shields/Locan school? A. The following general timeline has been developed for major milestones related to opening the new school at Shields/Locan avenues. Q. Has there been any discussion about putting a light at Shields and Locan, and what about other traffic congestion in the area around the new school? A. Before finalizing the school design, the District completed a 25-year traffic study to ensure that adequate traffic control will exist around the school. Already planned in the area is a stoplight at Shields and Locan avenues, and a pedestrian controlled signal at Locan and Cortland avenues (what is called a hawk crossing) to assist in controlling entrance and exit to the school. The District is still in discussion with the county regarding other possible traffic control measures to address on-going development in the area. Q. Why did CUSD build another elementary school? A. Clovis Unified continues to grow in enrollment. Elementary schools in the Clovis East High School Area are reaching 850-1,000+ in the next five years unless we open a new school. This puts a high strain on school facilities, and stretches our resources thin. Examples include: not enough classroom space, too many portables, restrooms, student discipline numbers, or not enough time in the library or computer lab. Our enrollment target is between 650-700 at most elementary schools in the district. Q. How do I know if I am in the boundary area for the new school? A. The boundaries will be finalized by the CUSD Governing Board in February of 2019. A website has been created to keep the community informed of the boundary study process and can be accessed from the home page of cusd.com as well as home pages of Clovis East Area schools. CUSD Today articles will also be used to keep the community informed as well as direct home to school communication from Clovis East area schools. Q. How can I keep informed about the new school’s construction? A. Interested community members can sign up for updates from Principal Kacey Gibson online at www.ShieldsLocan.cusd.com. This website will be maintained as the school community develops. Q. Will Shields and Locan have the same academic programs as my previous school? A. While each school is unique, academics and instruction will continue to be planned based on the needs of ALL students. Clovis Unified is committed to providing comprehensive opportunities to students, and the new school will have a full complement of co-curricular and academic programs. Still have quesitons? We invite you to make any comments or ask further questions about the elementary boundary adjustment process through the form below.